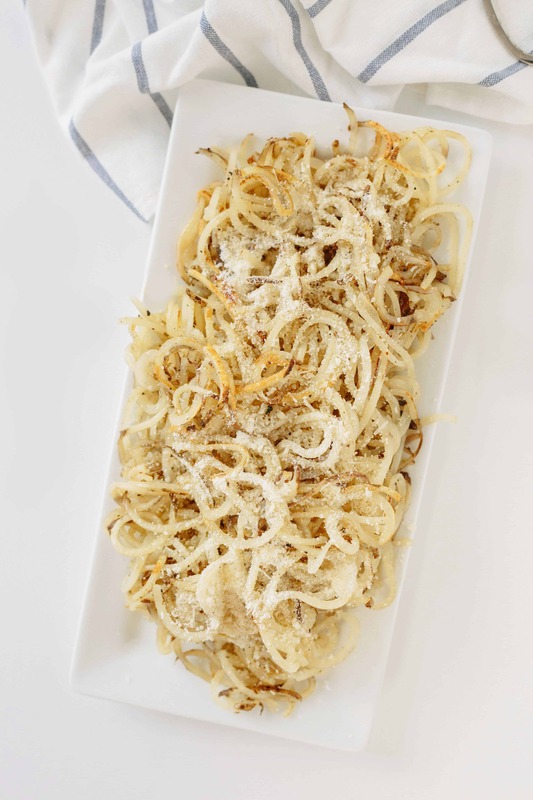 After everyone’s comments asking me how I made my spiralized Parmesan potatoes over the holiday, I decided they were just too good not to feature them on the blog. Plus, they’re only three ingredients (potatoes, garlic powder, parmesan) if you’re not counting olive oil, salt and pepper. These potatoes are the perfect side dish to serve alongside your favorite protein or to add to a bowl meal. Let me show you how easy they are to make! I love that my family embraces spiralizing. They actually request spiralized food while I’m visiting them! And if you follow me on Instagram, you may have seen my Instagram Live on Christmas Eve and Christmas Day. I had a few glasses of wine and was dancing while spiralizing. Ya, that happened. We serve them with green beans, a brussels sprouts salad, and steak, while my sister and I had veggie burgers! Why do I love spiralizing potatoes so much as a side dish? Besides the fact that the consistency is more enjoyable and who-doesn’t-love-potatoes, you actually end up eating less potato than you normally would, because of the noodle form. It’s much fluffier and takes up more room on your plate, so it’s one of those forced portion control situations. 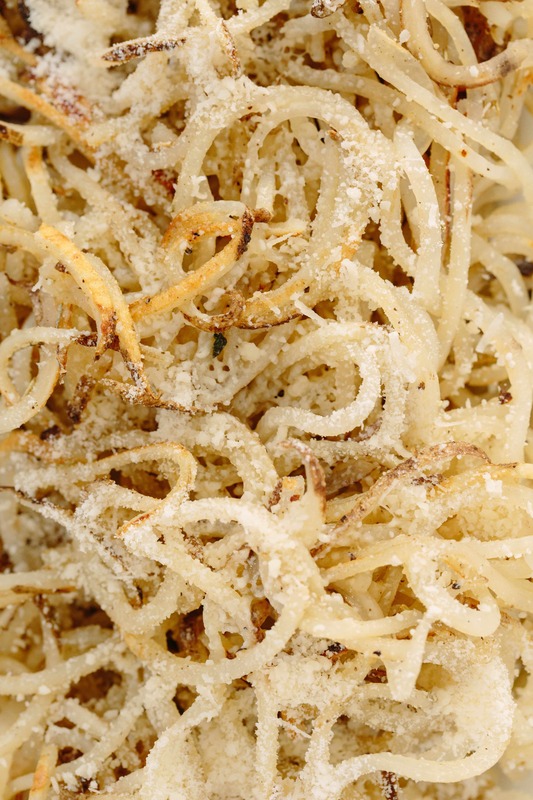 A half of a potato spiralized looks like much more than a half potato diced. That’s the magic of spiralizing! Serve these with anything and season them any way you’d like – with some dried rosemary, some chili powder for spice, some fresh thyme, whatever! They’re potatoes, so season them as you normally would. Happy Sunday! If you’re meal planning tonight, remember we have Spiralized Meal Plans in Gluten-Free and Vegan! Heat the oil in a large skillet over medium-high heat. Once oil is shimmering, add in the potato noodles and season with garlic powder, salt, pepper, and rosemary, if desired. Toss well to combine. Let cook, tossing occasionally, until cooked through and lightly browned, about 10 minutes. If you watch a crispier texture, add more oil. 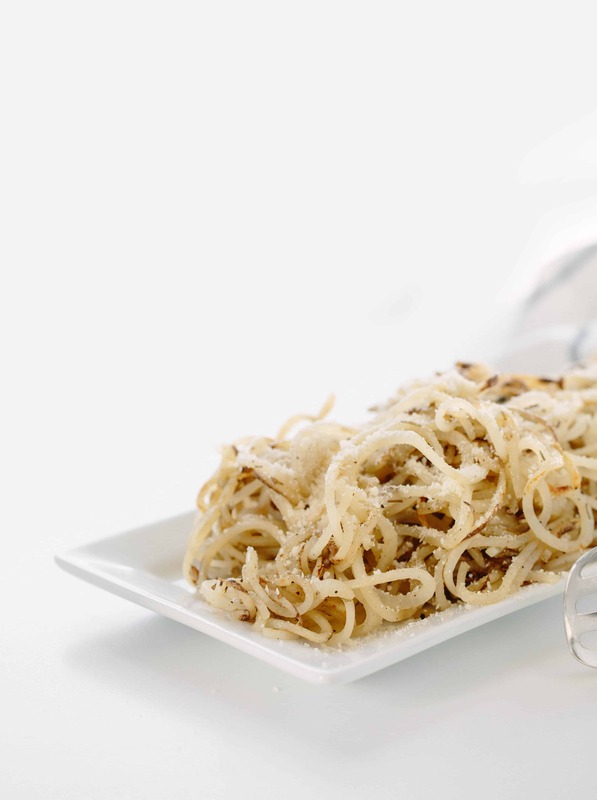 Transfer the noodles to a serving platter and top with parmesan cheese. Garnish with parsley, if desired. Serve. How much parmesan cheese do you use? I don't see it listed in the ingredients list. Can sweet potatoes be used vs russet? Yes, but they won't have the same consistency or flavor! Hi, can you bake it instead of fry? I made these last night as a side with turkey burgers. They were so tasty and were the perfect substitute for unhealthy french fries while still tasting similar. My husband had to have it as his "last bite of dinner". I will definitely be adding these as a regular menu item! These look absolutely delicious! Quick question . . . what do you mean by "noodles trimmed"? Noodles trimmed just means using a pair of kitchen scissors to cut the longer noodles after you spiralize so that they're not so difficult to eat. Looks yummy. Can't wait to try. Hi I was checking out the nutritional value and it says per serving? How much is a serving.